Spoilers below for the latest episode of Supergirl. It was an episode that featured the first major appearance of Kal-El (as a pre-Superman) on Supergirl, but “For the Girl Who Has Everything” was far more important for showcasing what could be the last appearance of a major character, as viewers bid farewell to one-half of actress Laura Benanti’s contributions on the show, with Astra soon to be pushing up daisies with presumably evil petals. It was a shocking death, to be sure, but it may also become a major rift between Kara and her sister Alex. Supergirl really changed the game up by killing off Astra, and it came during an episode that was already fraught with Kara’s emotional stress regarding her family and her past. Kara physically spent the first chunk of the episode on her apartment floor with an alien parasite dubbed Black Mercy stuck to her chest, which causes her to mentally jaunt to Krypton with her family. The clever attack was a ruse by Non, who will now be a widower as he continues with plans on bringing in a huge nefarious scheme, which goes by the mysterious name Myriad, to take down humanity in some way. 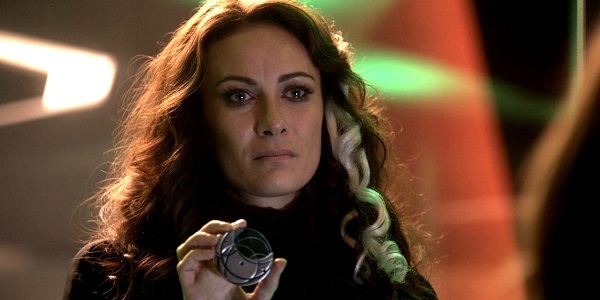 Astra certainly seemed like she would continue on as a villain for the rest of Season 1 and possibly beyond, and while it remains to be seen how strongly her absence will affect the antagonist side of things in the long run, the death has planted another interesting tree of deceit in the Danvers sisters’ relationship, as well as Kara and Hank’s. Alex was the one who used that Kryptonite sword to kill Astra – get the marketing team on that one quick – but Kara is told that Hank is the one who did it. Which means he both figuratively fell on the sword as well as literally killed someone with the sword, and he had nothing to do with the sword. So now Kara will have to sort out her feelings over Hank killing her aunt, while still so relatively new at learning how to have ”being an alien” as a point of reference for commonality with someone. She’s also going to talk about it with Alex at some point, and then Alex will be all guilty over hiding it from her sister, and then those secrets are going to lead to other secrets, and before you know it, the only one telling the truth on the whole show is Cat Grant, who definitely isn’t drinking any whole milk. What I’m hoping for is Hank’s Martian Manhunter appearing as Kara to Alex for one conversation, and then appearing as Alex to Kara for another conversation, all in the name of keeping everyone out of all loops at all times. Until everything comes out and relationships get shattered. The episode was based on the classic Superman comic story “For the Man Who Has Everything,” by Alan Moore and Dave Gibbons. And though the episode didn’t have the emotional impact of the source material – partly because the show is still so new – it made sense for this to be one where something major happened that, after a half-episode of Kara living in a memory, forces her to go through something she can’t look back from. At least, assuming the Flash crossover episode doesn’t involve Barry running back in time and discovering that it was really Alex who killed Astra. How is there not already a TV show about a private detective who runs back into the past to solve crimes? So while we won’t have to worry about Astra doing anything harmful to anyone, everyone is going to be busy trying to stop the whole Myraid thing, even though Astra’s dying words were to say that it’s already too late. Thankfully, we aren’t actually saying goodbye to Laura Benanti, who will still be around in hologram form.